Since my so-called dreadful capitulation in my alcohol-free Lent, Alastair has been whinging about Lenten solidarity and the like, so yesterday evening I showed my solidarity in an act of joint penance by going out on an alcohol-free pub crawl across Cambridge. 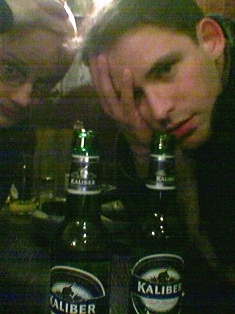 Our mission: to discover how many exciting types of alcohol-free lager were sold in the public houses of our town. Cambridge is a cosmopolitan kind of place, after all – you’d imagine there’d be quite a variety. 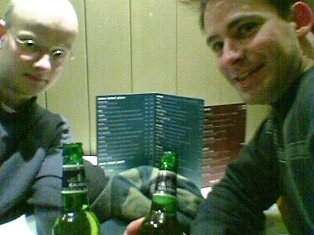 We’d had a tip off that the Slug and Lettuce did alcohol-free lager, so that is where we started. After all, beggars can’t be choosers. However, it turned out to be a hoax, the man behind the bar pityingly informing us that they had nothing of the kind, so we shook the dust from our feet and embarked on our journey. 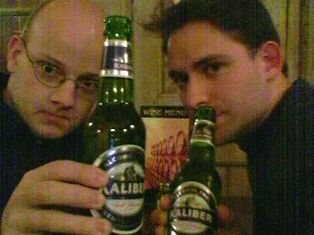 Onwards we went, via the wanky bars in the vicinity towards less classy regions, taking turns in the humiliation of politely asking what they had in the way of alcohol-free lager, and each time getting a different sort of negative response (varying from downright bewilderment to people laughing in our faces and, in one instance, fetching the bouncer). Six pubs and six misses later we were beginning to despair – but then we remembered that Cambridge is the proud home of the largest pub in England (at least that is what I was told when I arrived in Cambridge seven years ago), a huge Wetherspoons which surely would have a full and exciting range of non-alcoholic lagers for our enjoyment. We reached Wetherspoons with excitement welling up inside us, only to hit an obstacle which nobody could have predicted: we were asked for I.D. A slightly vain 26-year-old, I would usually be flattered by such an incident, as would Alastair (who claims to have looked forty since the age of sixteen). But in our growing lager-lust we weren’t in the mood for compliments, and fumbled quickly for our various means of identification. Cambridge (if you don’t know it) is now largely pedestrianised and has a ridiculous one-way system that means it is quicker to walk across it than it is to drive, so few of its many residents bother driving into the town centre and I presume as a result, like me, tend not to go around with their licences. And just how many people walk around with their passports on a day-to-day basis? Wetherspoons clearly having adopted a policy of putting ex-convicts on their doors to keep out as many customers as possible, we were forced to turn away. It was almost enough to make one pack in Lent altogether and have a good double gin. And this marked a turning point in our evening, because from there it was a short step to the Baron of Beef, which also had Kaliber, and then old favourite The Eagle, which had – well – Kaliber. And so I ended our evening with a firm resolution to write sternly worded letters to at least eleven pubs (starting with Wetherspoons) and to maybe start a campaign to get our drinking establishments fully stocked with non-alcoholic lagers. I bet I could get funding from a fundamentalist group somewhere – I could call it the Harold Bishop Trust. As we got on our bikes to cycle soberly homewards, we asked ourselves how much longer we have to do this for. Lent has been going on for several months already, but Easter still seems to be weeks and weeks away – how is that possible? And why has Lent never taken this long before? “There ought to be a sequel to It’s a Wonderful Life set at Lent,” Alastair sighed. Yes. Called It’s a Terrible Life.